In 2019, Chinese pork production losses of 25% to 35% are expected in response to ASF. Reports of extreme losses (over 50%) are limited to confined areas. According to Rabobank, production losses from African swine fever (ASF) have eclipsed initial estimates. The Chinese pork production shortfall, along with shortfalls in Southeast Asia, will create challenges and opportunities for animal protein exporters. Since its discovery in August 2018, ASF has spread to every province in mainland China. With ASF now affecting an estimated 150-200m pigs, the expected 30% loss in pork production is nearly 30% larger than annual US pork production and equivalent to Europe’s annual pork supply. As the government eased restrictions on the movement of animals (and pork), regional prices converged, but moved higher along with the herd loss (see figure). China’s herd-rebuilding will be slow and take years. Producers remain cautious given the risk of recontamination and are focused on improving biosecurity at remaining operations. 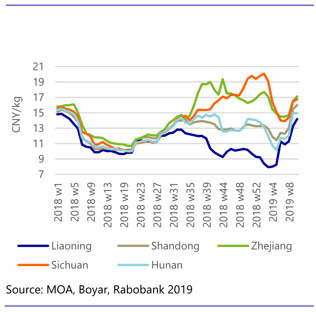 Rabobank expects available global protein supplies to be redirected to China in an effort to satisfy the growing protein deficit. This unprecedented shift in trade will likely create unexpected product shortfalls in markets previously served by these suppliers, creating short-term market volatility that will ultimately result in higher global protein prices. A secular shift towards lower Chinese pork consumption will support increased demand for poultry, beef, seafood, and alternative proteins that will shape global production trends. Animal protein companies with an exportable surplus and access to markets in China and Southeast Asia stand to benefit from the impacts of ASF. The EU, the US, and Brazil appear best placed to respond to increased import demand for pork and other animal proteins into China and Southeast Asia. ASF has entered Europe: the disease is endemic in parts of Eastern Europe, such as the Baltic States and parts of Poland, and Russia. ASF outbreaks have been recorded in a number of other countries, including, notably, Belgium in September 2018. The potential for outbreaks to restrict exports from significant pork-producing countries, such as Germany, cannot be ruled out. Such restrictions would complicate the trade response to ASF in China and Southeast Asia. The US is a major pork producer and exporter, yet the current tariffs on US pork exports to China are restricting current trade. Further, the US is a major poultry producer and exporter, but cannot export to China due to a ban associated with avian influenza imposed in 2015. If the trade tension that underlies these barriers does not ease soon, it could also complicate the global trade response to ASF. April 2019/ Rabobank/ The Netherlands.